The Surrey Hills Challenge is excited to confirm that, following the success of the inaugural event this year, the 2017 event will take place on Sunday 24th September. The inaugural Surrey Hills Challenge charity event on Sunday 25th September was a huge success with over 500 entrants participating in one of four walking and running challenges on the beautiful landscape of the Surrey Hills Area of Outstanding Natural Beauty (AONB). The Surrey Hills Challenge is delighted to confirm that the first male and first female for each challenge will receive an additional prize to mark their achievement as well as their finishers medal. The Surrey Hills Challenge charity event is calling all families to get out and active on Sunday 25th September and join in with the Five and Ten running and walking events. The challenges are perfect for families of mixed fitness abilities and will take place on the beautiful landscape of the Surrey Hills, Area of Outstanding Natural Beauty (AONB). Surrey Hills Challenge Medal & T-Shirt are here. 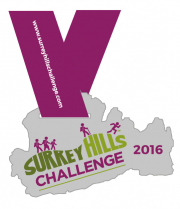 The Surrey Hills Challenge is a series of running and walking events that will take place on the beautiful landscape of the Surrey Hills, Area of Outstanding Natural Beauty (AONB) on Sunday 25th September 2016 raising funds for the Community Foundation for Surrey and the Surrey Hills Trust Fund. The Surrey Hills Challenge is set to be one of the biggest sporting challenges in Surrey next year with a series of running and walking events in the beautiful landscape of the Surrey Hills Area of Outstanding Natural Beauty (AONB) on Sunday 25th September 2016.